Armenia is often called an "open-air museum", since there is so much of history around you, it seems that nothing you see or touch is from the modern era (OK, we�ll make exceptions for the shiny new boutiques and electronic shops springing up all over Yerevan--but even they are descended from the old world of and the Spice and Silk Roads). The number sacred monuments (churches, monasteries, chapels, shrines and Khachkars, or stone crosses) is truly mind-boggling. ; There are more than 5,000 churches, monasteries and chapels in Armenia, and over 20,000 Khachkars in the small territory of the Republic alone! After a while, seeing all those churches and stone crosses can make the visitor kind of bleary-eyed, especially those who don�t understand their special meaning, and the traditions from whence they came. ; Basically all the same in central design, none are the same in their details, and it possible to detect earlier Urartian, Hellenistic, Roman, Persian and Arab influences on the design over successive centuries, which make them living museums of the past, and a lot more interesting to see. There are even holdovers� from Armenia�s most ancient past, in stone carvings representing the zodiac, sun dials, and iconography from her animist and sun worship pagan traditions making their way into the church ornamentation. But a little architecture primer is required to better appreciate the distinct character of the churches. ; And believe me, with this primer you will know more than the average local Armenian, and very likely more than even visiting Armenians from the outside world, about the sacred architecture in Armenia. ; Nothing like being able to knock off a few facts to impress the rest of the group, eh? 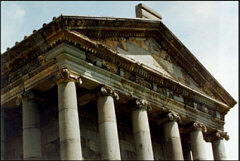 The earliest churches were built on pagan temples. The designs and forms were borrowed from the Greco-Roman styles, which relied on volume (taking up space) with carefully orchestrated combinations of vertical and horizontal lines in the columns, on the carvings and the friezes to differentiate the building from those around it. ; The temple of Garni is a good example of the type of sacred building that existed throughout Armenia before the advent of Christianity. 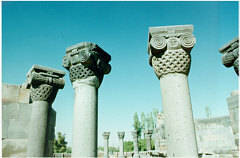 ; Another is the temple of Sushi at Erebuni, an Urartian fortress city unearthed in Yerevan. ; Urartu borrowed deities and cuneiform from the Mesopotamian region (Assyria and Babylon) and used human-animal combination in its representations of gods, as well as a type of frieze design that looks a bit like that found in Mycenae and Assyria. ; The friezes made their way to Christianity in the form of frescoes (translated through the Greco-Roman friezes and mosaics). ; But the ideas of using animals to represent gods and their likeness, or combining animal and human forms (winged angels, Lion, eagle, the lamb) are very old symbols from the pagan era, which survive to the present day. At the very first, simple crosses were erected on the sites where a pagan temple was located and that was enough. ; As the crusade to convert the pagan population gained momentum, the fervor with which Gregory and his army destroyed the pagan temples increased, and new "temples" or churches were built on the same foundations of the pagan ones, which dictated their size and first designs. ; One of the things you will notice about almost Armenian churches is that they are small. ; The largest church might fit 500 worshippers if they stand shoulder to shoulder, perhaps more, but they are not the spacious and awe-inspiring gothic cathedrals from Europe. ; This is both a limitation in early engineering (flying buttresses still have a few hundred years of development), but also a deliberate device to at the same time imitate the style of the prior pagan temple, and then renew it with a completely different iconography--meaning to keep the smaller size of pagan temples (which were only intended for the elect priests and royalty--not that many in the population), and at the same time to extend it both up and out to allow an unheard of idea to admit more worshippers into the sanctuary. You can detect the basic outlines of pagan temples within the sanctuary itself, a rectangular or square space, the altar always oriented towards the East (a pagan tradition completely usurped by early Christians). 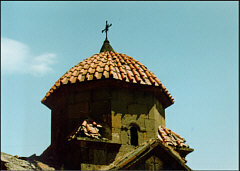 ; From there, the form changes radically, and; Medieval Armenians developed a unique type of construction, which found its way to the Byzantine empire and Europe. The development of sacred architecture in Armenia can be divided into three important periods; 1) Formative, from the 4th to the 7th cc. CE,; 2) Mature, from the 9th to the 14th cc, and 3) Late, from the 15th to the 19th cc. ; These also coincide with the Early, Middle and Late Medieval periods of Armenian history. 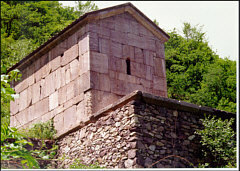 The new style of church is attributed to the vision of St. Gregory, where the saint received annunciation of the site where four churches were to be built; three Martyria (shrines in honor of martyrs of the faith; two of which where to be dedicated to the Virgins Hripsimeh and Guyaneh), and the future cathedral of Vagharshapat (present day Echmiadzin), for which the form was also dictated: a cupola (or 'tent') supported by four columns. An historian of the struggle for Christianity in Armenia, the 5th c.; Agathangelos describes the vision with a brief description of heaven, earth and the void. ; Heaven is domed (khoranard), with a firm roof (khoran), suspended in the void. ; Khoran occurs several hundred times in the Armenian bible, and is one of the key terms used in Armenian architectural symbolism. Legend had it that from the moment of the vision forward, the church had received its instructions from God on how to create the new temples. ; But the cathedral of Echmiadzin is not the first cathedral or church built by Grigor. ; It was preceded by the church at Ashtishat, which Grigor had built in Western Armenia, on the site of the temple of Vahagan (the god of war in the Armenian pagan pantheon), where the relics of Saint John the Baptist and of the martyr Athenogenes were buried. The official missionary work of St. Gregory led to the systematic demolition of many temples. ; At first crosses were placed where they had stood, but later steles, altars and Christian churches were built to replace them. ; As these churches were enhanced, designs based on Early Armenian, Roman and Hellenistic designs were used, but within 100 years the churches took a shape all their own, one which is distinctively Armenian. As early as the beginning of the 7th century Armenian architecture had achieved such a high level of completeness that the same 'language', with very few modifications, can be seen in the centuries to follow. ; Central plan layout, and the systematic use of stone cupolas for the middle spans of churches became integral features of design. This earlier roots can be seen in the technique of erecting pure volumes of large longitudinal edifices atop stylobates with large steps, similar to that of the pagan temples: the rigorous design of the large central dome churches, which take on the solemnity of the mausoleum of the classical era, also in the use of the compact masonry of large, well-cut and precisely-laid blocks, in the masterful orchestration and proportioning of spaces delimited by arcades and rounded vaults, and in the use of stylistic systems and elements closely related to those of; Hellenistic architecture. The earliest form is the single nave barrel vaulted hall with an polygonal or semicircular apse. ; Very close in form to pagan temple designs, the churches are huge volumes of mass which imitate their pagan predecessors. Additions to this basic form were the installation of open-air baptismal fonts and adding chapels on flanking sides of the main altar with repeated chapels in all the corners of the rectangular floor plan. 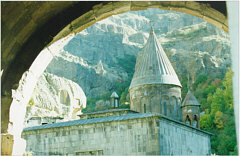 ; Examples are St. Hripsimeh in Echmiadzin (5th-6th cc); St. Astvatsatsin of Aragiugh (5th-7th cc); and St. Astvatsatsin of Avan (5th-6th cc). Along with the single nave form, there developed a central form design, which was first implemented by Gregory the Illuminator between 301-313 CE in Echmiadzin:; a domed church with a single quadruple apse and four angular chapels. ; In 484-488 CE the floor plan was modified to a central form with protruding apses and two chapels flanking the main altar. 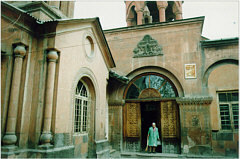 ; This type of church became know as the "Echmiadzin-Bagarin" style. ; Examples of this early form are at St. Hovhannes at Mastara (5th-6th cc), St. Sarkis in Talin (7th c),; at Voskepar (7th c.) and St. Grigor of Haridjavank (7th c.). ;; Advanced forms of this style, which include cylindrical internal diagonal niches and external triangular niches, are Okhte Dernin Vank of Mokhrenis (5th-6th cc), St. Hovhannes in Avan (618 CE) and Hripsimeh of Echmiadzin (618 CE). 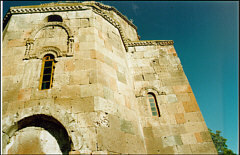 Attempts to harmonize these two forms began in the 5th-6th cc, with domed constructions of the single nave Poghos Petros church in Zuvuni; and the St. Sarkis triple nave basilica in Tekor. ; This experiment signaled the birth of the domed hall and the triple nave basilica (the 5th c. Katoghikeh of Dvin, and the 630 CE Guyaneh of Echmiadzin and 7th c. Odzun). 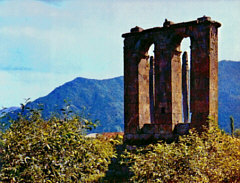 Cruciform churches developed into single, triple or quadruple apses such as St. Stepanos of L'mbatavank (7th c.). The most unique form of church in this period is that built with a central circular floor plan. ; A first magnificent example of this construction is the Royal Cathedral of Zvartnots, as well as St. Yerordutiun (6th-7th c) and St. Tadeos Zoravar in Yeghvard (7th c.). The influence of the Romans is found Martyria, an extension of the mausoleum. ; Among the Romans veneration of the dead demanded tolerance of the practice of burial, which extended to both Christian and Jewish burial rites. ; Roman custom and law dictated that the relatives of executed criminals had the right to bury the victim: death was thought to somehow redeem the offender (whose crime, in many cases, was simply that of being a Christian or a Jew). Catacombs, borrowed by the first Christians from Roman Jews, was not only tolerated by the authorities; the areas where the catacombs were located were even considered inviolable (at least until the 3d century, when special laws removed this protection). ; The construction of chapels in the cubical offered the Christians an opportunity to assemble and pray. Mausoleums were built on two levels, the ground floor reserved for the interned, with a chapel or church built on the upper floor. ; Monuments to the dead are very close to Roman monuments, also to the tradition Christians adopted from the ancient Semitic tradition in Mesopotamia regarding the individual construction of tombs, cut into rock, or partially or completely excavated below ground level. ; These were usually chambers with a square base, of different sizes, with niches on three sides (for one or more corpses), and a staircase for access from ground level. ; The entrance usually featured a facade preceding an antechamber. In Armenia these structures can be found including the Martyria Guyaneh and Hripsimeh at Echmiadzin, over which the apses of the churches built in later periods are built. ; The martyria of Hripsimeh was reconstructed in two phases, in the place of a two-story structure, represented on the eastern side of the southern stele. Another is the 5th century memorial monument beside the cathedral of Odzun. The monument at Odzun is two storied, quite similar to that of the stele of Aghudi (Sissian region). This kind of memorial monument, after its re-introduction onto the Armenian scene in the 11th; century (the funeral chapel of St. Stepanos in Tzakhatz Kar, Yeghegnadzor region , and the steeple of St. Astvatsatsin, at the entrance of the convent of Tatev in Goris region) became particularly widespread, especially during the 14th century when the library at Goshavank (Dilijan region ), and the funeral chapels of Yeghvard (Ashtarak region) and Amaghiu Noravank (Yeghegnadzor region ) were constructed. Beginning at the end of the 9th c., monastery complexes began to evolve around churches throughout Armenia. ; These quickly became important centers of learning and religious training. ; As the demands for monastic communities increased (spiritual, educational, scientific, manuscript copying, etc.) there developed a specific architectural style. ; These are the gavitner ("narthex", a portico or lobby to the main hall), zhamatuner (parsonages), shanatuner (refectories), divanatuner (archives), matenadaran (monastery library) and bell towers. ;; Gavits have perhaps the most interesting architecture: a square floor plan with two to four pillars supporting a cross-vaulted roof. ; Light was provided through an opening in the dome. ; The domes were often elaborately carved in geometric patterns that actually enhanced the strength of the supporting structure. ; Examples are found at Sanahin, Goshavank, Haghartsin, Makaravank and Saghmosavank.